So, I took my C63 to the shop today to get 3 baseline runs with 1300 miles on the clock. I was hoping to hit 370hp+, but fell a bit short. It was a Dynojet248x, which is raised off the floor. The fan was pointing at radiator and I put my hand in front of the intake inlets and couldn't feel any of the draft. Would a better fan setup raise the numbers? Runs 1 & 3 were done in 5th gear except we hit the speed limiter around 155-160mph but the Tach was only at ~6200 RPM. Run 2 was done in 4th gear (to avoid the speed limiter), but it looks like it just got cut short when looking at the graph. Doesn't peak HP come just after 6200RPM? Can someone also look at my Air/Fuel mixture and see if it is within spec, it was done with an O2 meter in the exhaust? Also, we couldn't take TQ measurements because he needed to hook up an sparkplug wire connector, but the tape was around the wires and I didn't want him to break off the ziploc attachment. Is there another way to get the TQ reading? The numbers are SAE corrected, with smoothing at 5. That translates to 430hp I think. Thanks for the help, this was my first time on a Dyno so sorry for so many questions. Last edited by BerBer63; 03-04-2009 at 10:25 PM. Reason: Added weather,etc. Isn't there a special dyno mode you have to be in if you don't use a 4 wheel dyno. Something about ESP and traction control freaking out? Yea I had Dyno mode enabled with ESP/ABS off. Also, just for comparison he had a CLK63 file to compare. The CLK63s 3 runs were 355,353,362 HP - about equal peak HP. 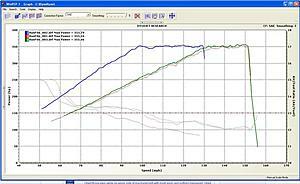 Except the area under the curve on my C63 was about 1/4 to 1/2 Inch higher or above than the CLK63, I'm guessing there is more power throughout the RPM range in my C63 in this one case. Last edited by BerBer63; 03-04-2009 at 10:38 PM. The C63 does have a dyno mode. i did alot of dynos with my car. my stock was 375whp in 5th gear with the limiter kicking in. IN THE SUMMER now if im not mistaken does it or does it not matter about the gas you use in the winter? i heard that winter gas can lose you power. you also have 2 lil miles on the car. beat on it more and then wait for the summer gas and try it then. 355 is low and what i hear is summer gas does make a big change about 20 hp in change. When you run in dyno mode does it "lock" the trans in a single gear? What I'm asking is how do you do a dyno that is a specific gear. Like mentioned above only 5th or only 4th gear? Because normally as soon as you hit the kick down switch it's going to drop the gear to the lowest it can. Sorry for the off topic question but what is the diff between summer and winter gas. Sounds about right for 91 octane. 5th gear would've yielded lower hp (6-10rw) but higher tq (8-10rw). Runs 1 and 3 were 5th gear, both 355HP. Run 2 4th Gear was 353. How do you guys get torque numbers? He had to attached a metal clip to one of the ignition coil wires, but I didn't want him to remove any electrical tape or the ziploc fastener on the coil in fear of messing with my warranty. Any thoughts on that fan setup, does it make a X amount of HP difference? The bumper was blocking any wind from hitting the inlet tubes. Vadim at VRP did my stock dyno. He could probably answer your questions as he has done many dyno runs with MBs. Great guy and very professional. Maybe he will chime in. Strip the tape back from the driver's side front coil plug and connect a small inducive clip to the red wire. Yes, insufficient airflow can cause detonation especially in the higher rpms on the dyno. 355 is a bit low. Hans C63 and others are in low 370s. To read TQ you will need to clip RPM pick up on red wire off one the coils. Runs look pretty clean. You can clearly see how AMG keeps the power at fixed level by keeping throttles open at 50%. 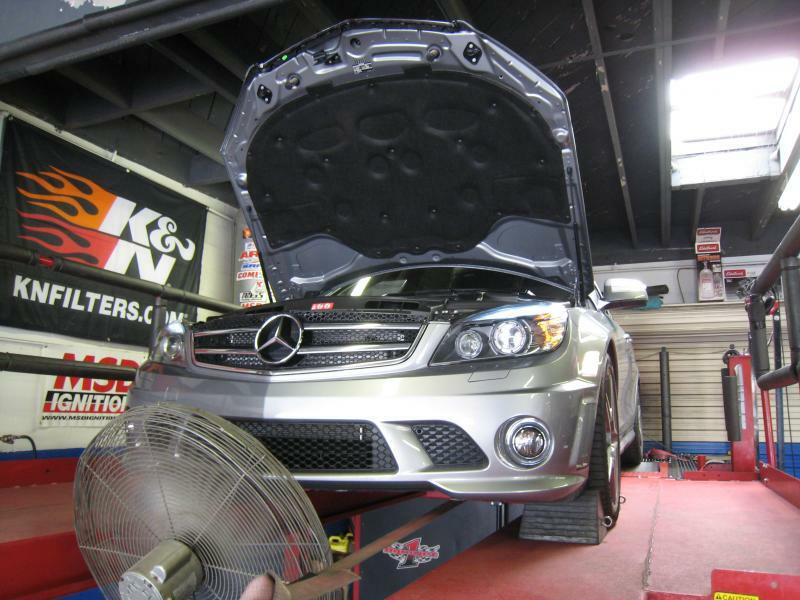 Our software tune fixes that, as well as retuning spark and fuel. 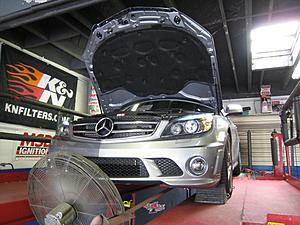 This C63 we just did recently. Blue run is baseline done in 3rd through 4th gears. This is why there is a dip at 92 mph. 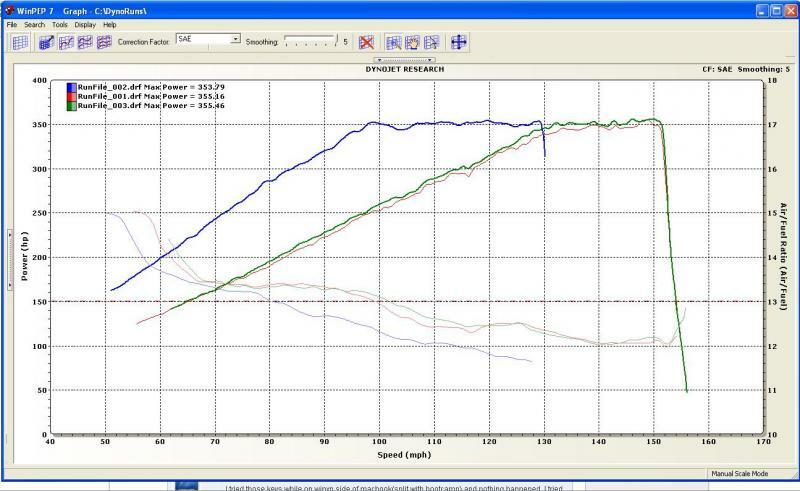 Red graph is software - +54RWHP/43RWTQ. What is the software u installed? Dude. You're bumping multiple 7yr old threads this morning. Are you high? I'm tuning my car, and need all the help I can get. I've been reading a lot of posts and threads lately for the C63. Is that not allowed? You can try threads that are a little newer. Use the "SEARCH" function at the top right of the page.